When you hear "Port Royal Jamaica" - what comes to mind? I think of pirates, earthquakes, taverns, sailing ships, treasure, drunkenness and decadence. I also think of scrumptious fried fish and bammy. Port Royal today is visited more for its delicious seafood than for any other reason. The infamous days of piracy, naval battles and lavish lifestyle can now only be imagined. Even though those days are in the distant past, the town is still well worth a visit. Let me show you pictures I took of Port Royal as it is now, while I tell you a little about its place in the history of Jamaica. 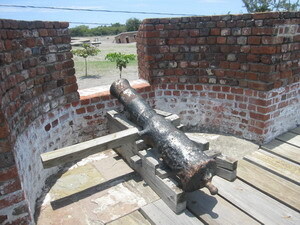 On a trip to Port Royal Jamaica, you won't want to miss Fort Charles. 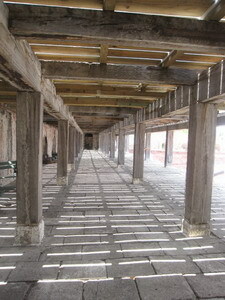 It is a memorable historical site, built in the 1650's. In 1654 Jamaica was under Spanish control, and Spain was at war with England. Oliver Cromwell, Lord Protector of England, sent an expedition to invade the Spanish island Hispaniola. When the expedition failed, its leaders did not want to return home in shame. They turned their attentions to capturing Jamaica, which was poorly defended. The buccaneer Henry Morgan was a member of the invading force led by Penn and Venables. By May 1655, the English gained control of the island, and began constuction of Fort Cromwell to defend their new acquisition. A community known as Point Cagway sprung up around the fort. When the monarchy was restored in England in 1660 and Charles II took the throne, the fort was renamed Fort Charles, and the Point Cagway became Port Royal. Why did piracy become so prominent in Port Royal Jamaica? Well, in order to economise, the British decided to use pirates/buccaneers (known as privateers once they were sanctioned by the government) to defend the new colony. From Port Royal, the privateers mercilessly attacked Spanish ships travelling the seas, as well as plundered towns located on the Spanish main (now South America). The governor of Jamaica made Henry Morgan commander of the militia in Port Royal. Whenever the buccaneers were successful, the town rejoiced, as many of the citizens invested in the buccaneers' ventures in exchange for a share of the spoils. One tenth of the loot was claimed for the King, and the rest auctioned. In 1671 Henry Morgan captured the City of Panama, his most notorious exploit. By this time, Spain and England were no longer at war, and England had outlawed privateering. Morgan was sent to England to be tried for his activities. Instead, King Charles II recognised him for all the wealth he had contributed to the monarchy's coffers. Morgan was knighted, and sent back to Jamaica as Lieutenant Governor, his privateering days now at an end. While privateering was booming, Port Royal was also growing into a thriving centre for trade. It was perfectly situated in the central Caribbean, at the entrance to one of the largest natural harbours in the world (now Kingston Harbour), with deep waters to accomodate large merchant ships. Even after the end of the buccaneer days, the town continued to grow, and merchants ruled Jamaica. Port Royal Jamaica became the most important English city in the New World, rivalled only by Boston. There was a tolerance for various religions that was unusual in 17th century English colonies - Jews, Anglicans, Quakers, Presbyterians all had a presence in the city. Life became very cosmopolitan, with all the latest English fashions and fads being in evidence. By the late 17th century, the economic opportunities presented by farming became apparent, and many merchants began to invest in plantations. 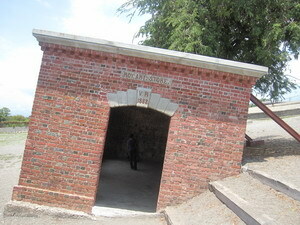 Port Royal became a central point for the profitable slave trade. The wealth of the city grew to enormous proportions, and with it, its reputation for lawlessness and wickedness. Disaster struck on Tuesday, June 7, 1692. A terrible earthquake, and multiple aftershocks, saw 33 of the city's 51 acres of densely populated land slipping beneath the sea. A huge tidal wave added to the destruction. 2000 people died, buried bodies were unearthed, ships were flung on to dry land. Of six forts, Fort Charles was the only one left standing on dry land. After the earthquake, there was widespread looting. Many people went across the harbour to settle in Kingston, which was a new town. Others stayed on, and rebuilding began. But 11 years later, in 1703, the town was razed by fire. Following that, a number of hurricanes seemed intent on destroying what was left of the wickedest city on earth. Through this series of disasters, Port Royal Jamaica has "devolved" into what it is today - a quiet town known for its amazing history and its seafood. 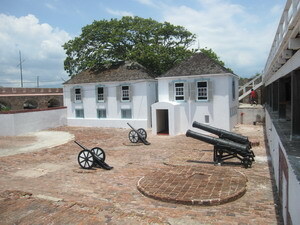 Fort Charles remained the Royal Navy's headquarters in the Caribbean until 1905. In all 250 years of its existence, the fort was never attacked. The small museum on the site is extremely informative, filled with objects rescued from the sea floor. Thousands more artifacts remain underwater. 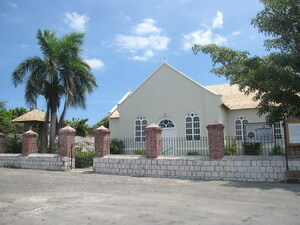 St. Peter's Anglican Church was built in 1726, to replace the church that was destroyed in 1692. Here you can find the tombstone of Louis Galdy, who was swallowed by the earth, flung back out into the sea, and finally washed ashore by a wave. I thoroughly enjoy visiting Port Royal Jamaica. It opens up my mind to another Jamaica, a time that I can only just imagine. The Giddy House (Royal Artillery Store) really does make me giddy. And as for the seafood...I can't help you to taste it. That ball is in your court! Port Royal isn't the only quiet Jamaican town with a bustling past. The town of Black River has a very interesting history as well. And that's my town, so you can't afford to miss it.